How much is my Zeitter & Winkelmann up right piano worth? There is a number on the top right edge under the lid, 41695, what does that mean? Just above the keys there is a brass plaque which reads "Klaviere A.W. Zimmerman Darmstadt"
Hi! My name is XXXXX XXXXX I can assist you. Can you please provide measurements? The piano is approximately 54" x 45." Width is dependant upon where you're measuring. Including the keyboard it is approximately 24." There is a large embellem inside the piano, primarily gold in color with a contrasting red depicting a stylized piano sitting on top of a cube with the initials Z W taking up the left and right faces of the cube. Below that is the date 1837. 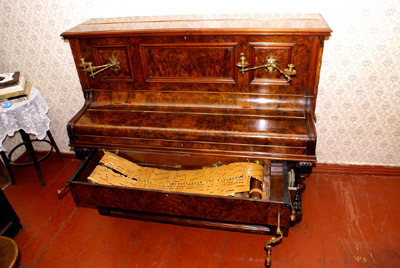 There is a small line of trim missing from the top right front of the piano which can be seen in the picture. The over all condition of the piano is slightly worn with small scrapes here and there on the edges. The interior though is in what I would say is very good condition. I did look up the name Klaviere A.W. Zimmerman Darmstadt from the brass plate just about the keyboard and got an address in Germany. From your serial number, which should be the number you gave, your piano dates circa 1920-25. The brand is of good to very good quality when compared with others of the same styles and eras. The current retail for an example such as yours in good condition ranges from $850 to $1,500 today. Comments on this make: Pianos made prior to 1940 are of good quality, modern baby grands and uprights tend to be of lower to medium quality. However as of 1992, they have been taken over by Bechstein, who produce a fine piano with the Zimmerman name. If my information has been of value to you, please remember to click the ACCEPT icon so I will be credited by JustAnswer for my time and efforts (at no additional charge to you). Thanks! Is this 50+ yr old lamp a replica or movie prop, or antique? I purchased a west branch novelty company cedar chest at auction. I have a cherry wood baby grand piano that was my grandmothers.